FLOW is a 5-person rock band made up of KOHSHI (Vocals), KEIGO (Vocals), TAKE (Guitar), GOT'S (Bass), and IWASAKI (Drums). Siblings KOHSHI (Vocals) and TAKE (Guitar) have been making music together since 1993. They formed FLOW in 1998. KEIGO (Vocals) joined in 1999 with GOT'S (Bass) and IWASAKI (Drums) joining in 2000 to form the current group. FLOW made their major debut with the single "Blaster" in 2003, showing the world their impressive musical strength and versatility, including their signature twin vocals. Since their electric debut, FLOW has provided a wide variety of anime opening and closing themes including: "GO!!!" opening theme for Naruto, "COLORS" opening theme for Code Geass: Lelouch of the Rebellion, and most recently "Kaze no Uta" and "INNOSENSE" for Tales of Zestiria the X. Furthermore as masters of performing live, FLOW is heralded as being energetic, exciting, and electrifying. In 2008, FLOW had successful performances in the Nippon Budokan. Since then, they've performed live all over Japan and the world. They've travelled to 17 countries including ones on Asia, North America, South America, and Europe and show no signs of slowing down. The band has put on a record number of shows in Japan. They continue to delight audiences around the globe with their unique sound and incredible live performances. 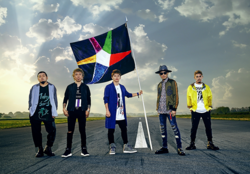 FLOW entered their 15th anniversary year starting in July 2017. To celebrate, they are holding a tour of 6 cities with seven performances. FLOW is also collaborating with GRANRODEO, reuniting for the first time since 2014. Their new single "Howling" will be released on January 24, 2018. You won't want to take your eyes off of FLOW for their 15th anniversary.